Today is Hailey's first birthday!! I can't believe that my baby girl is already a year old. It is so true that the days are long but the years are short. We are currently weaning baby girl from breastfeeding and while I am super relieved, I am also so sad that our special time is ending. But on to happier things!! 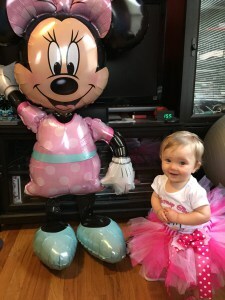 This past Sunday we celebrated Hailey's first birthday with a Minnie Mouse themed party. It was a ton of fun for both the kids and the adults! Below I breakdown the party based on where we got everything from. I hope this helps if you want to throw a Minnie Mouse party. At the end you can check out some shots of the birthday girl!! My Celebration Shoppe is an amazing Etsy shop with tons of printables for various birthday party themes. Our theme was Minnie of course and we chose to go with the pink black and white Minnie as opposed to the red. This shop has great packages for the full decor of the party as well as invites and thank you cards. Plus the shop owner is super sweet. I accidentally paid for something twice and didn't realize it and she totally pointed it out and reimbursed me. How awesome is that?! From this shop we got the invitations, thank yous, birthday banner, Minnie cutouts, and decorations for candies and straws. The items were easy to print out and came out beautiful. I loved having Hailey's name on everything which made the party feel so personal. For this birthday party, we decided to get the whole family matching t-shirts. I found this shop on Etsy that created a really cute and reasonably priced birthday tutu outfit for Hailey as well as matching t-shirts for the rest of the family. While Hails was the star of the show, I think the shirts really helped it feel like a family celebration. Here's a shot of the 4 of us in our shirts. The last thing we got from Etsy was a months banner for Hailey. If you follow along on Instagram you know that we took photos of every week and every month of Hailey's first year. I printed out the monthly pictures at CVS and the attached them to the banner. I love this little touch since babies change so much that first year. Since we didn't have the actual 12 month picture for Hails yet seeing as how her birthday is today, I just used a recent picture of her in her Minnie shirt of course! For the tableware, I decided to shop dollar tree. First off, Everything is a dollar and second I was able to ship to store for free. Most of the stuff we got from them (utensils, cups, plates, tablecloths, plates, balloons, tissue paper flowers) were generic pink. The only thing that was a little fancier was the plates since I happened to find plates with zebra stripes in the center and a pink with white polka dot border. It fit so perfectly with the colors I just had to pick it up. This helped us keep the costs down, plus anything we didn't use can be saved for any other pink party. The piece de resistance was totally the cake. We are lucky to have two people close to the family who are ever so talented and create the most amazing cakes for us. Hailey's Minnie Mouse cake was no exception. Barbara over at Celestial Creations made a beautiful cake and cupcakes for Hailey that looked almost too good to eat. But let me tell you, I'm glad we ate them, cause they were so delicious too! And just to round out the post, here are a few pics of the birthday girl! I definitely recommend checking out all of these shops if you are planning a Minnie birthday. The service was great, everything was beautiful, and most of all the birthday girl loved it! She said "Hi" to the Minnie balloon about 50 times, she devoured her cupcake, and she looked stinkin adorable in her tutu!! On Tuesday, we will be back to our regularly scheduled organizing in fact we will actually be looking at schedules, lol. See you then! Newer PostDoes Your Schedule Run Your Life?